Open Road Media Mystery & Thri, 9781624672712, 419pp. New York City: home to world-renowned museums, theater, restaurants, iconic sports franchises. Central Park. Wall Street. And an infamous serial killer who's terrorized the Big Apple for decades. The year is 1995 and the NYPD has just graduated a promising new patrol officer named Karen Vail. The rookie's first day on the job is anything but easy when she finds herself at the crime scene of a young woman murdered in an unusual manner. Vail is unsure of what she's looking at or what it means--but it's a case that will weigh on her mind for nearly twenty years. As the years pass, Vail's career takes unexpected twists and turns--as does the case that's come to be known as Hades. Now a skilled FBI profiler, will Vail be in a better position to catch the killer? Or will Hades prove to be Karen Vail's hell on earth? The character who has captivated readers worldwide--and who won the praise of literary giants Michael Connelly, James Patterson, and Nelson DeMille--returns in a story that captures the experiences that shaped the revered profiler and made her the top cop she is today. Alan Jacobson is the national bestselling author of several critically acclaimed novels. 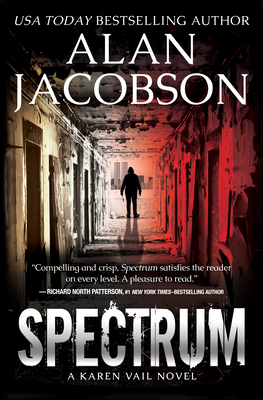 In order to take readers behind the scenes to places they might never go, Jacobson has embedded himself in many federal agencies, including spending several years working with two senior profilers at the Federal Bureau of Investigation's vaunted Behavioral Analysis Unit in Quantico. During that time, Jacobson edited four published FBI research papers on serial offenders, attended numerous FBI training courses, worked with the head firearms instructor at the academy, and received ongoing personalized instruction on serial killers--which continues to this day. He has also worked with high-ranking members of the Drug Enforcement Administration, the US Marshals Service, the New York Police Department, SWAT teams, local bomb squads, branches of the US military, chief superintendents and detective sergeants at Scotland Yard, criminals, armorers, helicopter pilots, chief executive officers, historians, and Special Forces operators. These experiences have helped him to create gripping, realistic stories and characters. His series protagonist, FBI profiler Karen Vail, resonates with both female and male readers, and writers such as Nelson DeMille, James Patterson, and Michael Connelly have called Vail one of the most compelling heroes in suspense fiction. Jacobson's books have been published internationally, and several have been optioned for film and television. A number have been named to Best of the Year lists. Jacobson has been interviewed extensively on television and radio, including on CNN, NPR, and multiple ABC, CBS, NBC, and Fox network affiliates.